Starting in Italy and spreading across every continent, pasta has been a staple at dinner tables for hundreds and hundreds and hundreds of years. But in the 21st century, there is a growing trend that shows no sign of slowing down. Some think it’s a bit fusilli. Some would call it the impasta pasta. But for establishments looking to cater to the growing demand for low-carb and gluten-free pasta alternatives, vegetable noodles are where it’s at. When it comes to making pasta out of vegetables, the Nemco Vegetable Noodler is in a class by itself. 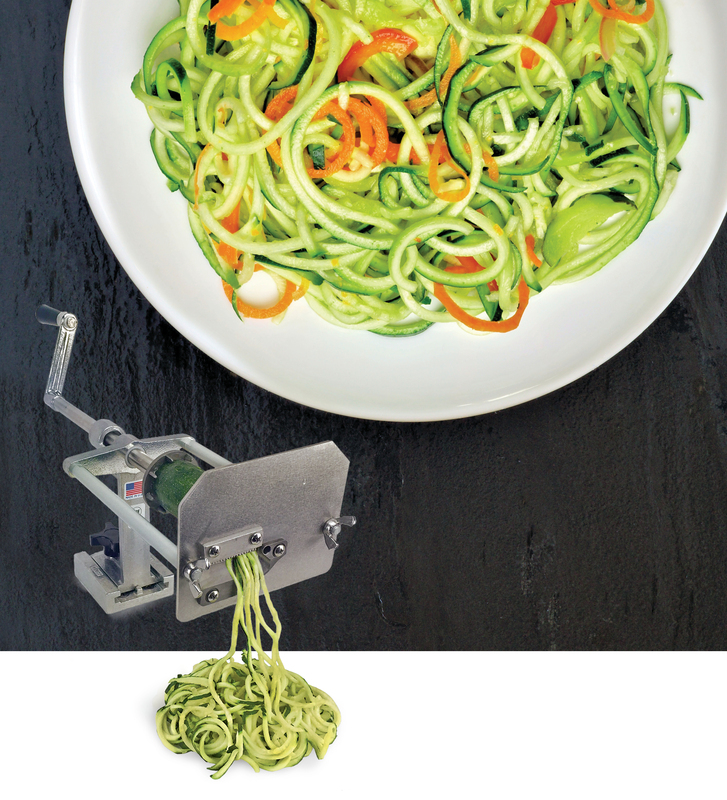 It can help you capitalize on the low-carb craze as the one and only zucchini-noodle machine that can deliver the commercial-grade speed and performance durability you need! Quickly turn zucchini and other firm veggies into a low-carb, high-margin pasta replacement. The 55050AN-P is the only NSF-approved (What is NSF, anyway?) commercial grade device of its kind on the market. The Easy Vegetable Noodler lives up to its name in numerous ways—maximizing your profit potential on every low-carb, gluten-free, spaghetti-noodle order. 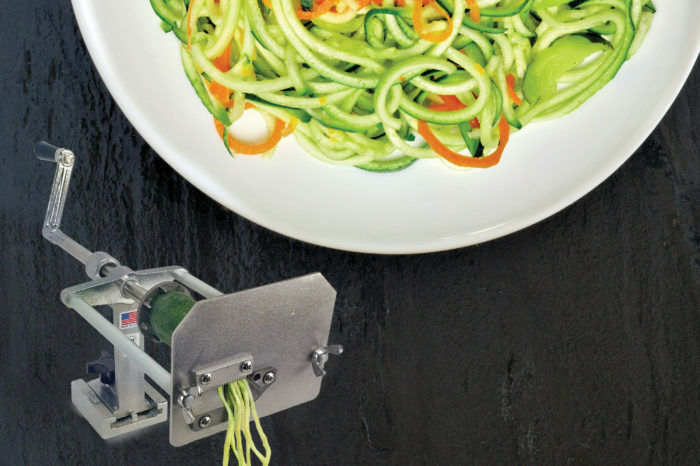 Most zucchini noodle makers are only available at the consumer retail level but Nemco’s Easy Vegetable Noodler is specifically built for commercial kitchens. 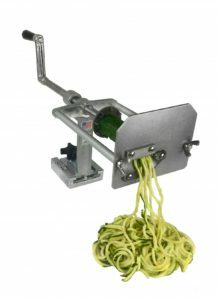 Easy to load: Cut the ends off of a zucchini, summer squash, sweet potato or other similar firm veggie, mount one end on the drive plate and slide the face plate up flush against the other end. Easy to use: The Noodler is securely mounted to the counter, perfectly balanced, and specially equipped with an extremely smooth drive mechanism. So, cranking out mounds of noodles, even at high speed, takes little to no effort. Easy to clean: Spin a few wing nuts and remove from the base mount. Just like that, the Noodler is prepped for a thorough wash down in the sink. Sound, simple mechanical design-operation minimizes potential for maintenance issues and makes troubleshooting a virtual no-brainer. Sand-cast aluminum construction withstands anything the commercial kitchen, yes, even yours, can dish out. Watch the Nemco Easy Vegetable Noodler in action above, and for all your pasta cooking and serving needs, make us your one stop shop and discover why, at Burkett, the pastabilities are endless!